Seventeen-year-old Friday Brown is on the run - running to escape memories of her mother and of the family curse. And of a grandfather who’d like her to stay. She’s lost, alone and afraid. Silence, a street kid, finds Friday and she joins him in a gang led by beautiful, charismatic Arden. When Silence is involved in a crime, the gang escapes to a ghost town in the outback. In Murungal Creek, the town of never leaving, Friday must face the ghosts of her past. She will learn that sometimes you have to stay to finish what you started - and often, before you can find out who you are, you have to become someone you were never meant to be. In her second novel, South Australian Vikki Wakefield gives us another superb cast of characters led by Liliane ‘Friday’ Brown, who spends her childhood dragged between remote country towns and isolated bushland by her larger-than-life mother. Vivienne Brown’s big personality and wild stories about the past are like a strangler vine around her daughter’s identity, and when she dies, Friday is left at seventeen with a mixture of naivety and hardness. The grip of her past loosens enough to send her into the city in search of her father, but she’s sidetracked when she meets a group of young squatters living like city rats under the command of a beautiful but Machiavellian girl named Arden. Friday’s bewilderment in the city is lifted when she eventually returns to the outback with the group, who have become a dangerous blend of friends, family and enemies. And, as the band falls apart, it’s up to Friday to define their ending, and so her search for self truly begins. 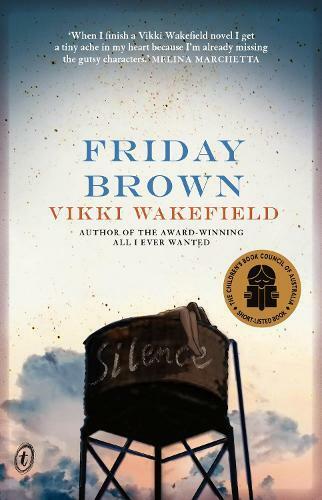 Wakefield creates extraordinary tension during the first half of her novel but it’s when Friday arrives in a desolate country town that the blood really gets pumping. It’s an action-packed second-half that may make you cry and will certainly make you want to champion Friday. Wakefield’s first novel, All I Ever Wanted, revealed her as an important voice in Australian literature. This beautiful, brave book cements that position. Written for a teenage audience, it has the scope for a broader appeal.